The nerve center of the Smithsonian Tropical Research Institute stands beside Ancón Hill, the Panama-flag topped landmark at the Pacific entrance to the Panama Canal. Named for benefactor Earl S. Tupper, the center has modern laboratories, a tropical sciences library, herbarium, insect collection, a conference center, and the institute’s administrative headquarters. More than a dozen staff scientists have laboratories and offices at the Tupper center. Their work represents a broad spectrum of STRI’s terrestrial tropical science, which addresses questions ranging from how climate change will affect forests to the history of human societies in the tropics. STRI's herbarium, soils lab, plant physiology lab and entomology lab are housed at Tupper. Why no poop in garden? Do objects have an occult life? The Smithsonian obtains the site of the Tivoli Hotel to build a new library and administrative headquarters. STRI’s library opens to house the biggest collection of reference material of tropical science in the world. STRI’s modern campus takes shape with the completion of the eight-story Tupper building, cafeteria and auditorium thanks to the generous support of the Tupper family. STRI’s administrative headquarters keeps tabs on all aspects of the institute’s operations. Scientific visitors can find orientation and resources to make their visits smooth and productive. 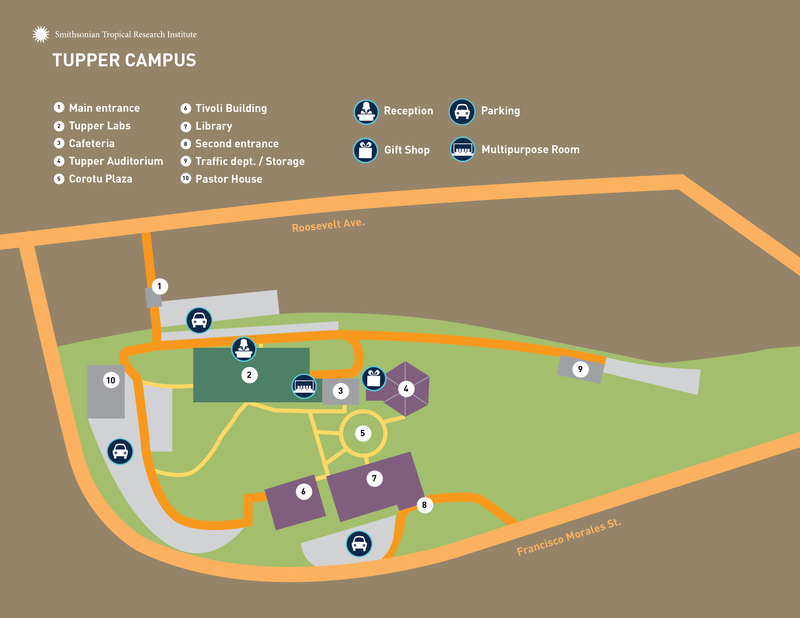 The Tupper campus has offices and research laboratories for scientists as well as space for visiting researchers, fellows and students. The library has an unrivalled collection of tropical sciences resources. There is a large auditorium, conference rooms, a full-service cafeteria and gift shop. The main building houses the offices for the director, associate directors, academic dean, visitor services office, communications and administrative branches of STRI. The Earl S. Tupper Tropical Sciences Library is one of the world’s most comprehensive resources for tropical biology, and traces its origins to the Barro Colorado Island’s field station in the 1920s.The collection contains more than 66,000 volumes, and the library maintains 500 subscriptions to scientific journals. In addition, the library has online access to the full bibliographic resources of the Smithsonian Institution Libraries in Washington, D.C., the Online Computer Library Center, a full set of online databases and more than 1,000 electronic full-text journals. STRI’s herbarium is a vast repository of the flora of Panama. It has more than 6,000 specimen records of which 5,100 are identified to species. The collection represents 17 families, 485 genera and 1,695 species. The herbarium’s specimens can be viewed in digital form online. Tupper offers both scanning electron microscopy and confocal microscopy services including processing of biological and non-biological specimens (fixation, dehydration, critical point drying and metallic coating). This facility is available to researchers and industries in fields the biological sciences (botany, entomology, marine biology, paleontology), health, materials science and other related fields. STRI’s communications professionals produce press releases, photography, videos, exhibits, posters, brochures and scientific illustrations. The team works closely with staff scientists and collaborate with the institute’s offices for public programs, academic programs and the director. The office handles media relations, social media and public relations. The Tupper complex has modern laboratories for entomology, plant physiology, soils sciences and microscopy. The seats 176 and hosts a weekly scientific seminar and other special events and presentations. A conference and exhibition room above the auditorium has a capacity of 200. The arboretum is home to a surprising range of ecological interactions. Several trees, orchids, shrubs, epiphytes, cacti and fruit trees have been either planted or maintained at the arboretum. Besides humans, birds, butterflies and agoutis frequently visit the site. In 1992, STRI botanists identified some tree species in a small section of the former Hotel Tivoli, thus officially “founding” the arboretum. Today, the arboretum is an example of the richness of tropical environments in urban settings. Breakfast and lunch are served Monday to Friday, except on Panamanian holidays. Coffee and snacks are available until 3:30 p.m., and 4 p.m. on Tuesdays. The menu includes a variety of vegetarian options. 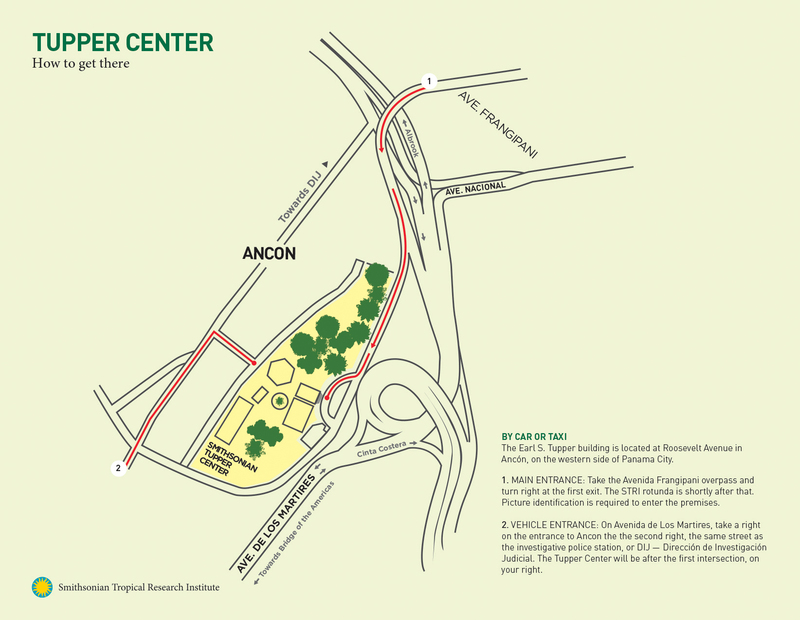 The Ancon Dormitories are conveniently located near Tupper, the CTPA and Naos Island Laboratories. The dormitories have eight shared apartments for up to 20 visiting students or researchers. There are six two-bed studio apartments and two four-bed apartments. The cost per person is $230 per month. All dorms include beds and linens, towels, desks and chairs, a dining table, hot water, Wi-Fi, and a kitchenette with a refrigerator, stove, microwave, cooking ware and utensils. The Earl S. Tupper building is located at Roosevelt Avenue in Ancón, on the western side of Panama City. You can take a taxi and ask the taxi driver to drop you off at the Smithsonian Tropical Research Institute near 4 de Julio Avenue on the same street as the investigative police station, or DIJ — Dirección de Investigación Judicial. For scientific visitors in need of support for research, please contact the scientific coordination office. Scientific visitors in need of assistance with logistics, permits, vehicles or other administrative issues, please contact the Visitor Services Office.